The pace of change is so tremendous, that by one popular estimate, 50% of primary school students today will end up working in jobs that do not yet exist.How do you even begin to plan for the future of work when it is unknown to you?Such a transformation calls for us to re-examine our assumptions and discover new ways to equip ourselves with skills for the future. Kampong – Jurong East is a quarterly zine that is a cross between a human map and a community sketchbook. It is a platform for a myriad of co-creators ranging from the elderly, the youth, migrants, professionals to non-professionals to intersect, explore and express the identity of Jurong East. Each issue features a thematically curated set of personal stories, photo collages and artworks excavated from the crevices of the HDB jungle to celebrate the perks and quirks of the community. With much creative freedom, we strive to present authentic stories that will evoke in the people of Jurong East a deeper consciousness about their community and inspire other readers to reflect on their own relationship with their neighborhoods. Come join us at our grounding session on 6 April 2019, 10 am. WE ARE LOOKING FOR FOLKS WITH SENSE OF CURIOSITY, WE’LL MASTER THE REST! Dressmaking used to be an activity that was meant to save cost from buying clothes but now it has turned into a niche that a few are practicing. We want to bring back the joy of having your own creative freedom regarding your fashion. Clothes that is made for you are always better than the clothes that are mass produced. So why not come on down to learn how to make your own cheongsam dress for the next Chinese New Year? What is your dream? What is passion? Design your life alongside two of Singapore’s inspiring hawkerpreneurs, Jason and Zhen Long from “Beng Who Cooks”, who will be sharing their stories of dreams, passion, failure, trust and community while imparting basic cooking skills. Slots are limited. So grab them now by whatsapping 9436 7383. There's life at home and there's life within the hood! Join us in unlocking a limited edition G(JEM) come 23 March, 10am to 1pm. Trace your path with us and help us uncover hidden g(j)ems that even the GPS may not be able to. These datapoints would be captured in our very own Jurong adventure walk which you would be invited to in the very near future! After weeks of capturing stories and interviewing residents in Yuhua, these budding mural artists have finally consolidated various mural designs for you to choose from! Listen to the stories of what this hood has to offer and vote for your preferred G(JEM) design to be etched on the walls! And because we believe that 'We win when we all share! ', each data point contributed would also entitle you to a series of fun-filled, life-sized games that will be popping-up in front of blk 319, brought to you specially by our friends from Ground-Up Initiative (GUI) ! WHO SHOULD BE PART OF THIS? Achievers who love a challenge! Or maybe just pure ice-cream lovers who love a mystery flavour! NO SIGN UPS REQUIRED! JUST SHOW UP AT THE DOOR! In this age of fast fashion and consumerism, who makes and mends things anymore??? Develop your upcycling muscles and Mingle with friends, new and old as you spend an afternoon tinkering away with your hands under the expert eyes of our local trusty handyman, sewing auntie and sustainability enthusiasts. 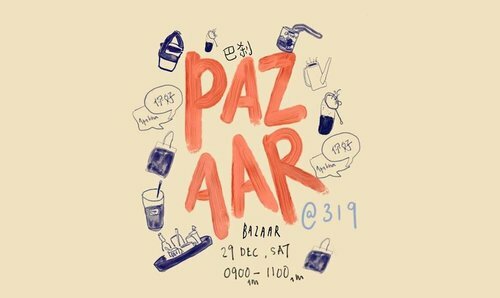 PAZAAR@319 -Feat. Lim Kopi Lo! A Modified Human Library Edition-They share their stories, you craft them into books! Choose to end 2018 through purposeful connections. You won’t know who else you’ll meet here! If you have said no to every other get-togethers, you may just want to be avail for this. Come and go as you wish but let these local stories be felt! Are you in transition? Starting to wonder if it's time for a change? Like to make a move, but don't know how? or simply life is good, but maybe could be a lil' better? In the spirit of fresh beginnings, we bring you a retreat of possibilities. Spend a weekend(1.5 days) tucked away in the western part of Singapore, as you unwind and go through a series of activities and experiences that would unlock the clarity of what's next in 2019 when it comes to varying priorities in life- work, career, play, health & relationships! Come with an open mind as you would now play the role of a life designer, as you practice and design collaboratively alongside new friends to experience what it is like to prototype your future selves! An All-Access-Pass to an array of creative workshops and interactive booths is now available at just $10! 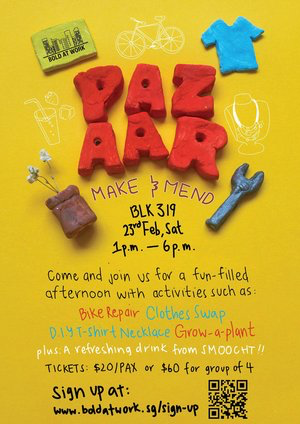 PAZAAR@319 is here to introduce what it is like to BOLD in the heartlands of Jurong! Come on down to have a fun time and let this neighbourhood charm you with its whimsies! Something exciting is brewing at BOLD that will LIGHT up your day. 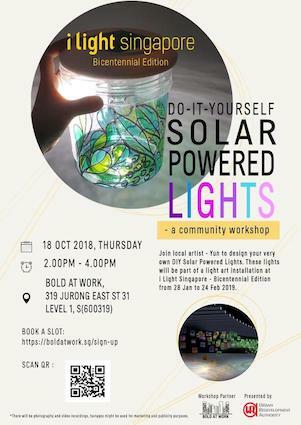 Join local artist - Yun, on 18 October (2pm - 4pm) to design your very own DIY Solar Powered Lights that will be featured in one of the installations at i Light Singapore - Bicentennial Edition next January! All Ages- Friendly! A MAD AT WORK prototype special brings together two young ladies whom have the common interest of providing a safe and comfortable space for people (young and old) to relax and be present. 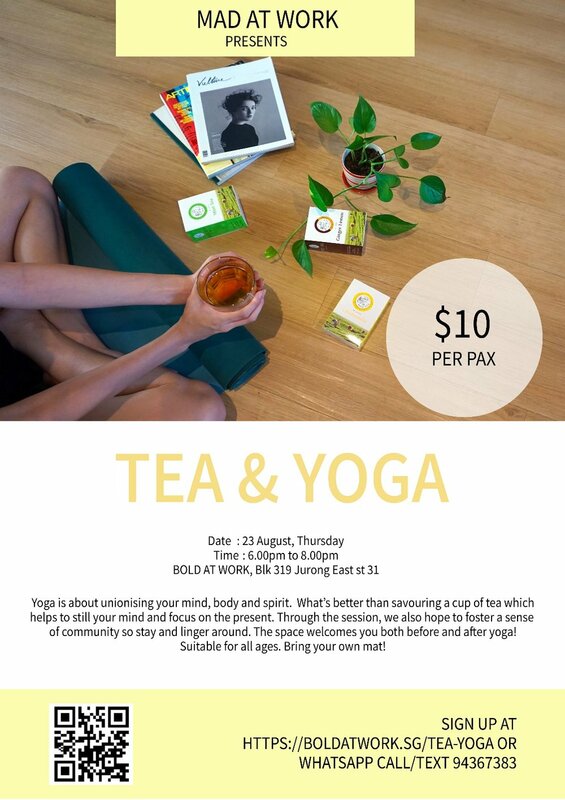 Come join them as they share their own knowledge and practice and hopefully leave you with not just a greater mind, body and spirit but also new friends through this magical experience. Pameran Poskad 2018 is a group exhibition of postcard-sized artworks that is open to anyone and everyone. It is about sharing the joy of experiencing art as an organizer, creator, appreciator and collector. This year, we brought it to the heartlands by holding the preview in Yuhua, at Bold At Work. PP 2018 hosted a series of creative community workshops and partners our designated charity - Beautiful People, where sales of works were donated. First of the Bold Speaker Series, reframing the future of work. If you were to take on a new perspective on the choices you make in life, what would it look like? What if you were free to define success on your own terms? What if your weakness could actually become a unique strength that takes you further in life than you ever thought? Join Photographers and creatives Ian and Alex to hear their journeys and how they connect the dots looking backwards. Archi Travel Pêcha Kucha II is here!!! 20 slides of archi travel photos x 20 seconds each. What architectural works have inspired you and kept you going? Which are the places that have moved your heart? Any top travel sights which stopped you in your tracks? Come join us in our merrymaking and celebration of these experiences. Share your personal favourites, and gain insight on what's good. We have put together a whole day of fun-filled activities just for you. From making ice cream, and concrete alphabets to immersing yourself in modern art, come and create your very own experience with us!